GAP is one of the biggest brands in the USA, and their lines of clothes are very popular all over the world. Because of this fact, You might be interested in purchasing some part of stock lot clothes of this brand. The offer has been presented by a French wholesaler. 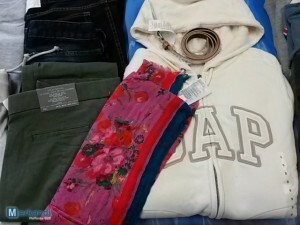 The stock lot includes 600 pieces of GAP clothing, but there is an option of ordering lower amount of it, because there is a minimum of 30 pieces per deal. All of these clothes are new, and packed in sets of 30 pieces each, so there are 20 sets total available to buy. According to the offer, there are men’s and women’s garments available, but the majority are men’s clothes like jeans, t-shirts and sweatshirts.